Awhile back, we featured an article about the Mars Curiosity Rover and all its achievements over the five years as it's been exploring the Red Planet. And as much as we've learned from Curiosity's roamings, that isn't stopping NASA from moving ahead full-steam with its next mission to Mars - Mars 2020. That mission will focus its attention on the potential for life on Mars. That includes exploring the planet for conditions friendly to life in the ancient past as well as looking for signs of past life itself. Additionally, the Mars 2020 mission will seek to gather information about the potential for colonizing the planet someday, including testing technology that could make colonization more likely. Among the most crucial tests for the Mars 2020 rover will be to test a method by which oxygen can be produced from Mars' atmosphere. Of course, that just scratches the surface of this expedition, which you can read about in detail on the NASA website or check out the video above from NASA Jet Propulsion Laboratory. 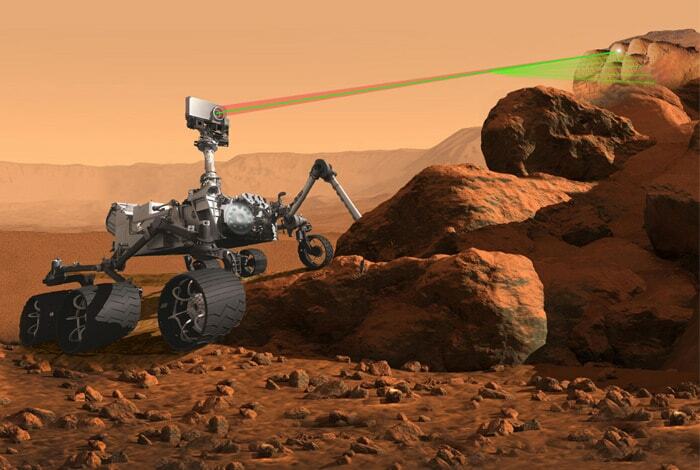 To enable scientists to have the best look yet at Mars, the 2020 rover will be equipped with state-of-the-art camera gear. 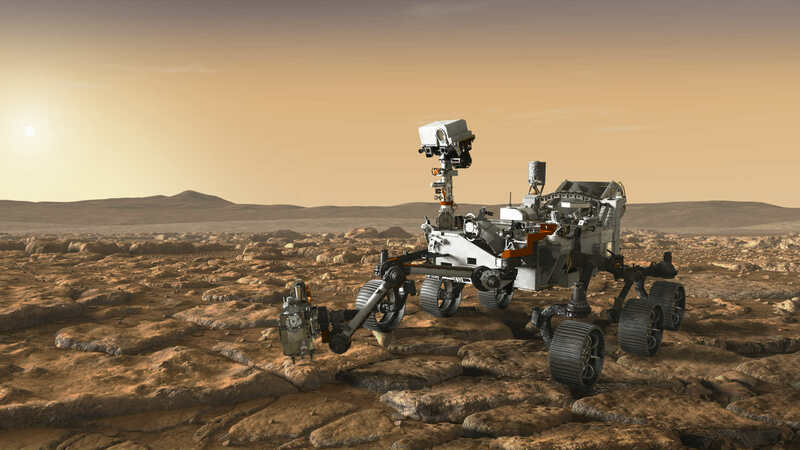 That includes 23 cameras (up from 17 on the Curiosity Rover), each of which has 20-20 vision and can create 20-megapixel images (compared to the 2.1-megapixel images from Curiosity). Considering the quality of the photos that Curiosity has sent back, like the one below, the upgraded cameras on the 2020 rover are enough to make you salivate. The cameras, or "eyes" as NASA calls them, have a number of different functions. Nine cameras will be in charge of observing the rover's entry into the Martian atmosphere, its descent to the surface, and its landing. The Descent Imaging Cameras, for example, will photograph the rover's descent from positions above and below the body of the rover. There are another nine cameras responsible for engineering tasks. This includes navigating the perilous surface of Mars and guiding the rover's tools, including its robotic arms. MastCam-Z, which is actually two cameras that work together to create three-dimensional color photos. 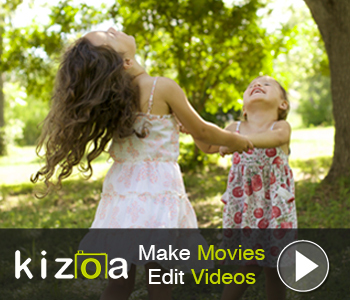 It's capable of video recording as well. The camera's zoom feature will allow scientists to get up-close images of distant features of the Martian surface. 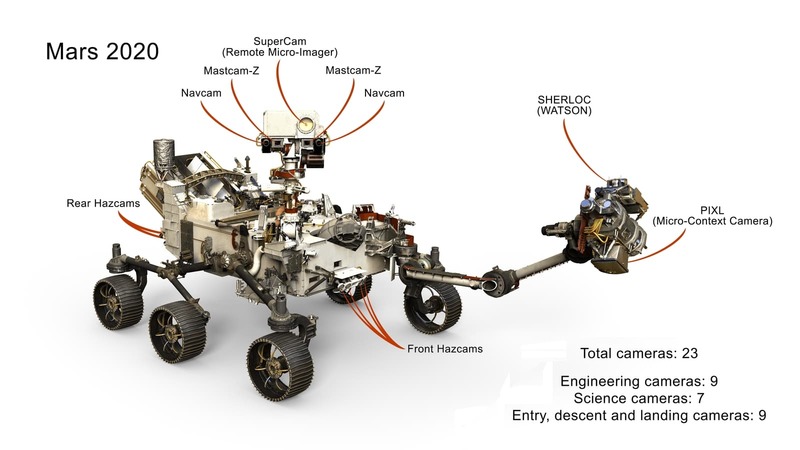 SuperCam (shown above), which is designed to examine the chemical makeup of rocks on Mars. The camera analyzes rocks for signs of organic compounds after they are vaporized by the rover's laser. PIXL, which uses X-rays to examine the chemical elements the rover finds on the surface of the planet. The camera is so advanced that it can target areas that are as small as a grain of salt. SHERLOC, which is mounted on the robotic arm of the rover. The camera works in harmony with an ultraviolet laser and a spectrometer to look for organic substances and minerals that indicate if water was present. WATSON, which works alongside SHERLOC to take wide-field images of SHERLOC's targets. Not only will the Mars 2020 Rover have more cameras, but they'll be more feature-packed as well. For example, where the Curiosity Rover's navigation and hazard cameras can only muster 1-megapixel images in black and white, the Mars 2020 Rover's engineering cameras can take 20-megapixel, full-color images. Not only that, but the new rover's cameras will have a much wider field of view. That means that instead of stitching a bunch of images together (as is the case with Curiosity), scientists will be able to take a peek at the Red Planet in one large-field shot. 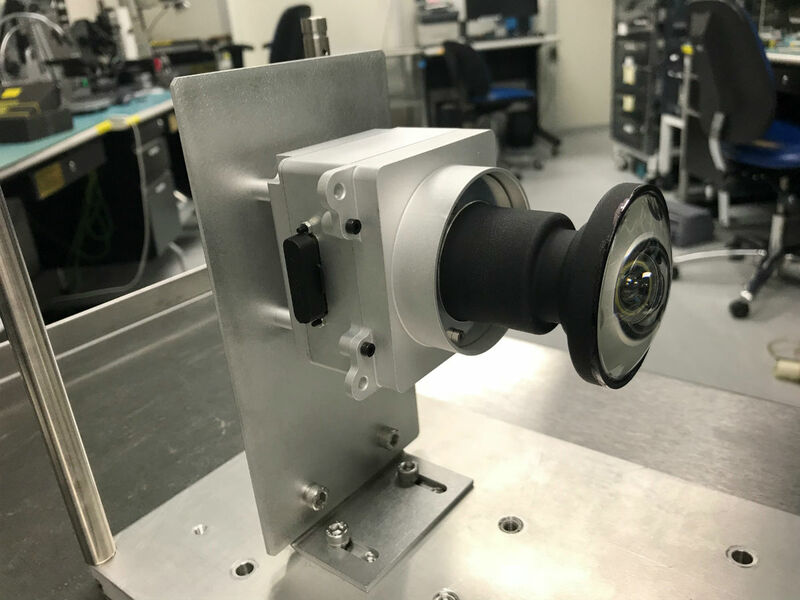 To top it off, the Mars 2020 Rover's cameras come equipped with anti-motion blur technology, meaning the rover can take images while it's driving around the Martian surface. The prime launch opportunity will be in July or August of 2020, which is when Earth and Mars are in a good position for an expedition that will require less power and time to get the rover to the Red Planet. The rover won't reach Mars until February of 2021. Though we have some idea of what a more thorough examination of Mars will find given what Curiosity has sent back over the last five years, it's still exciting to dream about what the Mars 2020 mission has in store. I, for one, am most excited about seeing the photos that the rover takes. With cutting-edge cameras and lenses, we're certain to be in store for quite a show! Learn more about the Mars 2020 expedition by visiting NASA's mission website. 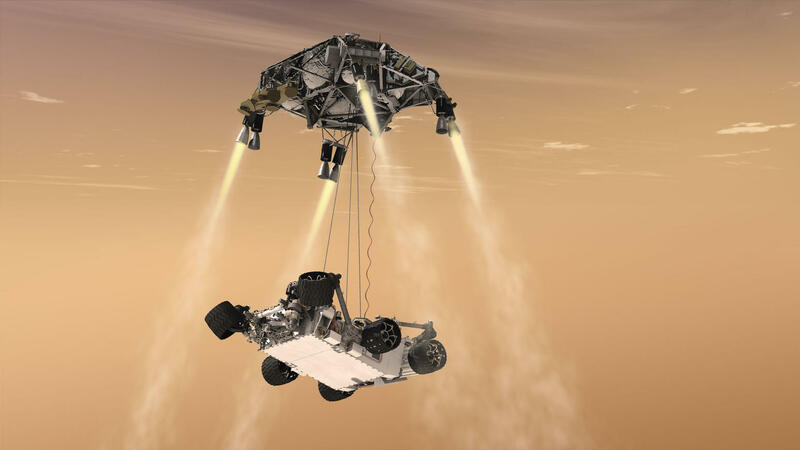 For a look at the test of the Mars 2020 Rover's parachute system, check out the video above.